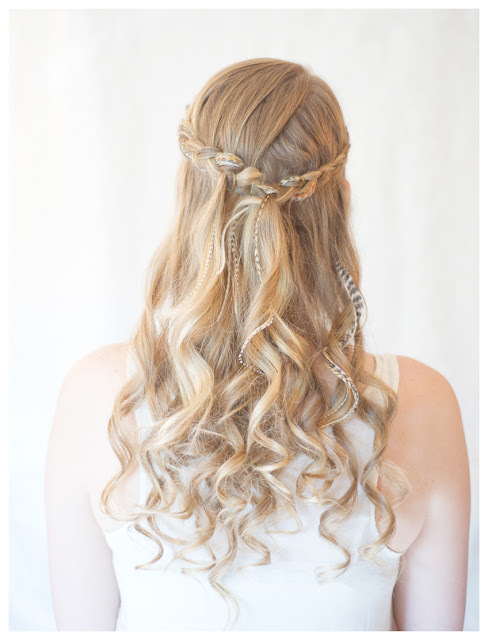 Step 1: Gather a small section of hair on one side to begin the inside-out braid. Step 2: Continue weaving the sections of hair under the braid. Step 3: Continue braiding down the side of the head. Step 4: Braid until you reach the center of the back of the head. Step 5: Securely bobby pin the braid to the center. Step 6: Begin the inside-out braid on the opposite side. Step 7: Continue braiding until you meet the other braid at the back. Step 8: Securely pin the braids together. Curl as needed!